This is the first time this annual prestigious award has been given to an officer of the RVIPF. Kartick, who presently heads the Criminal Investigations Department (CID), joined the Royal Virgin Islands Police Force as a new recruit 25 years ago. He served the majority of those years in investigations where he steadily rose through the ranks to his substantive post of detective inspector within the Major Crime Team. The awardee acknowledges that he works alongside many divisions within RVIPF who made it possible for him to receive this award including the Major Crime Team, Special Investigations, CID, Scenes of Crime and the Immediate Response Unit. “I don’t work in isolation but with a team of hardworking officers and for that I am grateful,” he said. 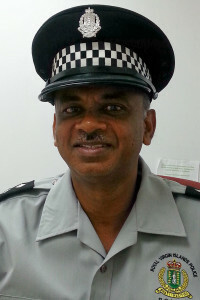 Commissioner of Police Michael Matthews expressed his delight that an award of this caliber was given to one of his officers. “I am delighted to be working with someone recognised for his work at this high level. He is a credit to the RVIPF as an organisation having started and moved through the ranks. And the fact he has now attained the position as head of CID is a tribute to RVIPF in that the Force has recognized his skills and given him just reward. I already see the critical role he plays in our crime fighting efforts and I am impressed. This prominent award is valued $5,000 and includes a trophy and an all-expense paid trip to the Association of Caribbean Commissioners of Police Annual General Meeting and Conference to be held in Suriname in May of this year.